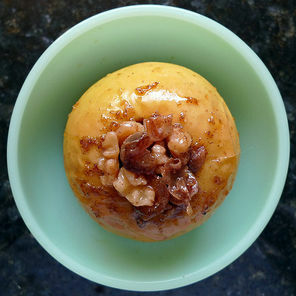 Curves and a Camera: Cinnamon + Apples + Goat Cheese + Honey = OMFG!! I get an email newsletter from The Stir and today they had this recipe. It's still a bit too warm to turn the oven on but you better believe the next evening it dips into the 50s or 60s I'll be coring apples and stuffing with honey goat cheese. Mmmmmmmmmmmmmmmmmmmm...oh, sorry about the drool there. 1. In a small saucepan, heat at the brandy over medium heat. Place the raisins in a bowl and cover with the warm brandy. Let sit until plumped, about 10 minutes. Drain, reserving the liquid. 2. In a small bowl, mash the goat cheese, honey, lemon peel, and 2 teaspoons of the reserved brandy until smooth. Add the raisins and mix until well blended. Refrigerate until slightly firm, about 20 minutes. 3. Scoop out the stems, cores, and seeds from the apples, leaving the bottoms intact. Using a paring knife, peel the skin from the top inch of the apple. Stand in a baking dish. 4. Divide the goat cheese mixture into 4 equal portions and stuff into the apples. 5. In a bowl, whisk together the cider, sugar, cinnamon and the remaining reserved brandy. Pour over the apples. Bake uncovered until the apples are tender, 45 to 40 minutes, basting every 10 to 15 minutes. 6. Remove from the oven and let sit for 5 minutes. Place the apples on plates and spoon the pan juices over them. Sprinkle with the chopped nuts and serve immediately. Beautiful! I wanna make this! this looks amazing! i think i'll try it without the brandy though...I don't generally keep any around!